We are officially in bonus time ladies and gents. Not bad seeing as how it is only the 20th – no whining about being down posts this month. There’s more than one reason this month is special – I finally overcame my demons today and managed to knock out three loops during our weekly Sunday Springdale Run. That’s right, 20 miles in the books on the nasty hillfest we torture ourselves about every weekend these days. The third loop has been my nemesis for over a year now – every time before I end up begging for mercy at the end of the second loop regardless of how well I felt at the end of the first. This time we held back a bit on the second loop too keep from tiring our legs out. There is a theory that there was some help from the Girl Scouts but further testing is needed before we can definitely say we have found a running secret! Note, I was so happy I checked this life list item off I enjoyed a Shamrock Shake – a rarity based on the calorie count that decadent dessert possesses – figured with over 2500 burned off during the run I could spare a few to indulge. 20 miles also signifies something else – I’m gonna need some time to rest the legs. Not one to waste a perfectly good afternoon, figured it could be spent cranking out this bonus entry. 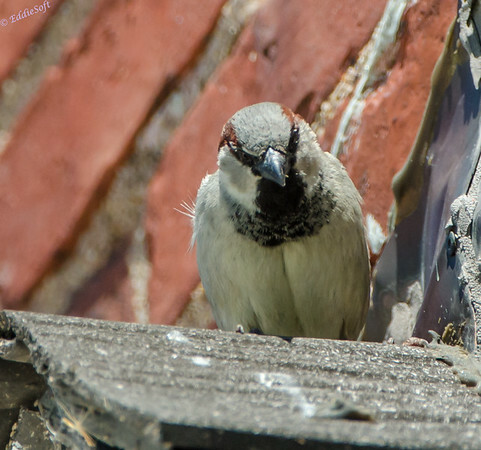 Now I’d like to introduce you to the House Sparrow. This happens to be one of the few Sparrows I can easily identify in the field. 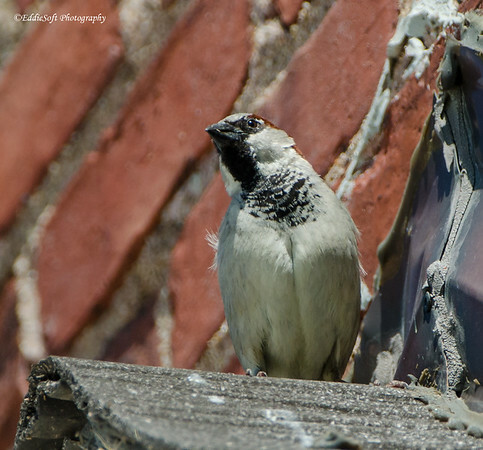 The black laced necklace of the male in these shots is easy to spot and distinctive enough to ID. At some point I’m going to distill all the key features of the various Sparrow members so my brother and I can quickly classify all the little brown jobbers that end up in the tin after any Midwest outing. Hit the jump to see and read more about this common North American bird. This specific set of the male was taken at Allerton Park in Monticello. If you frequent my little off ramp on the Information Highway, you should already be familiar with Allerton. This is the place with the odd statues (link here) and a whole multitude of bird inhabitants (link here, here and here). This little dude kinda flies under the radar while birding due to how common it is. In fact, most people are not happy when they show up at the bird feeders since they tend to overwhelm them with all their brothers, sisters, cousins, distant cousins, close friends, liberals.. you get the picture. Sorry, have to stand up for a second – major leg cramp – damn I hate those, but nothing a few drinks of my HyVee slushie can’t knock out. Okay, all better now, back to the House. 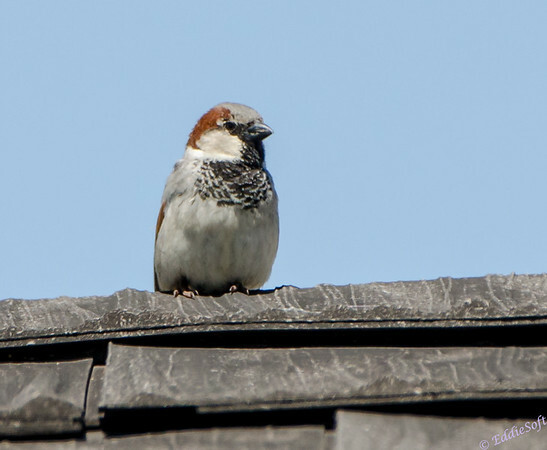 The House Sparrow appeared previously during my Project Chekov effort (link here). That would be the project that featured 26 birds in 26 days in alphabetical order (a bird a day that started with that day’s letter from A-Z). That project is one of those efforts that took a whole lot of time but the concept of the body of work was too subtle and went unheralded by my readers – no worries, still got 26 new check offs (get it?) on my birding list. Unlike Zoolander, this male Sparrow can go Left and Right (ha). By the way, I really didn’t notice until processing this set of shots in the digital darkroom just how graphically appealing their feather coloring is. Perfect symmetry from the brown eye lines, transitioning to the black lines to the beak and then boldly dropping down to the neck before it fans out into the necklace. Like most birds, the head on shot gives it an aggressive look. How about a few facts before I run out of shots. As alluded to above, these birds are resented by many because of their ability to displace native residents. They are not native to North America and instead were introduced from England into Brooklyn NY back in 1851 (by the way Cornell, you might want to add the origin of the birds in your description – I had to find other sources that provided that important bit of info). They have truly adapted to living with humans and now actually prefer manmade structures for their nesting areas. They are aggressive toward other birds in defending their territories (territories they steal from other birds). They also have a pecking order in their flocks – they size of the black patches give a visual clue to the order with the older birds (and thus higher on the echelon) have larger black patches. According to Cornell, this visual clue helps to prevent unnecessary fights. Well, that is all I have for you today – time to go roll out the legs – this time with a big ol’ smile knowing those tight muscles were a result of another Life List achievement. Congratulations on checking off another Life List item! 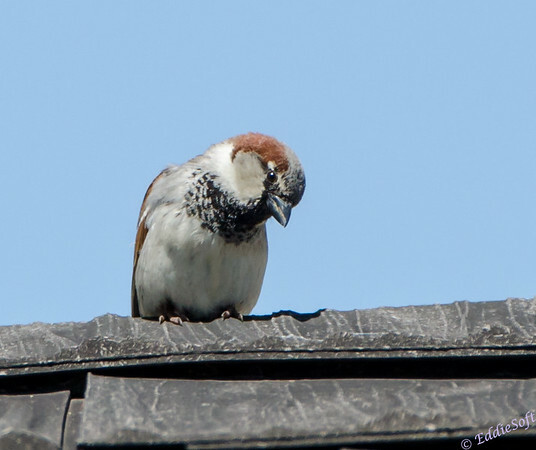 Nice pictures of a fearless House Sparrow. Those were the only birds I saw in common with the U.S. when I was in Australia, so they are everywhere. 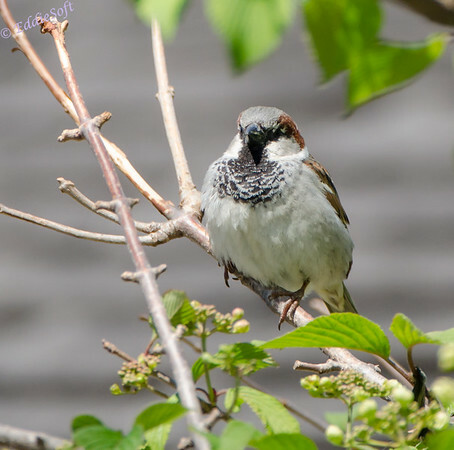 We took pictures of a House Sparrow off the parking lot at Allerton–was this the birding trip you took these shots on? 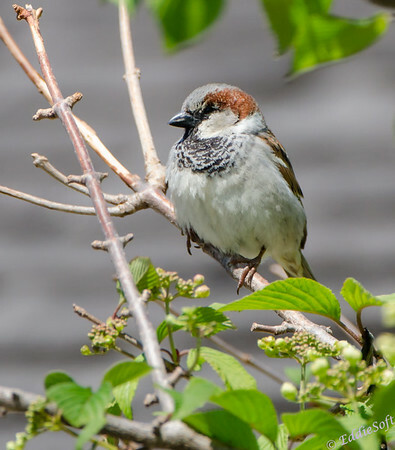 You could have added the female House Sparrow from somewhere else more recent that we were wondering about. I didn’t know when they were introduced or the fact about the pecking order depending on the age reflected in the size of the black bib. I’ll have to start paying attention to them! Thanks again for the pics and the information. They are definitely the prime example of adapting to every environment imaginable! 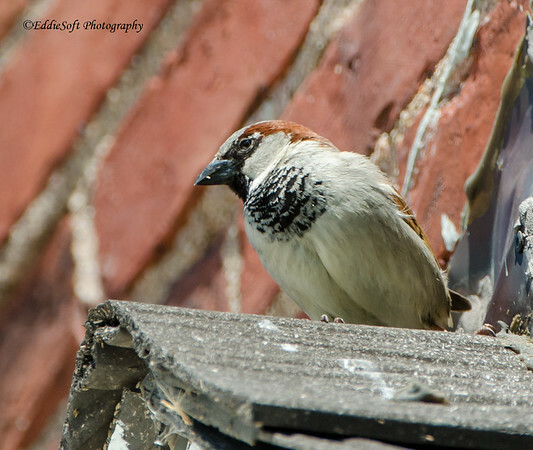 You are correct, this is the Sparrow I was shooting from the parking lot – nothing like getting some decent shots the minute we stepped out of the car – if only the other birds would be this accommodating – female House hmmmmm I wonder? Purdy pichures and som of dem cool faxes – talk about getting your money’s worth!